New collection There are 13 products. The finest bamboo fiber is handspun to give master weavers in Kathmandu one of the densest materials available to us. Because of this delicacy, they can not weave more than 6-7 cm of carpet a day, offering us a velvet touch incomparable. Dyes and washing further strengthen a little more shine and shimmer of this quality that will appeal to exception lovers. This dish weaving riding the ethnic-bohemian trend by animating the ground with a subtle mottled effect, reinforced fringes, in soothing tones. Evocation of Mongolian Paradise, the project with the same name directed by Taller recreated a garden city. Tribute to this utopia, this rug combines frame and color in harmony with sunny accents. This all-over pattern comes in timeless colorations to offer a sophisticated carpet that will enhance contemporary and classic decor. The bamboo fiber and wool blend gives it a singular shine and shimmer. Cradle of Taller in Barcelona, La Fabrica meets all artistic and creative disciplines, such as weaving multiple complementary skills. 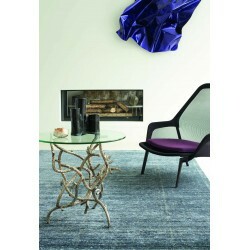 This carpet contrasting play of colors and materials, forms leads to an obvious motive, seductive yet innovative. Tribute to the work of mathematician Poncelet, the Tavern carpet, originally created for a Barcelona restaurant is based on the principle of prospective geometry. It finds its originality and freshness in the dynamic kaleidoscopic pattern, its round shape and unexpected colors assembly. The Walden rug is an allegory of garden and urban fabric. It brings color and symbol in the background. New coloring very warm for this carpet with waterproof qualities. It finds its place in outdoor carpets, the solution to the requirements of wet rooms or terraces is found! Finally a carpet deco easy to maintain that will find its place in the kitchen dinates because of its simplicity of maintenance. He also knows how to make everything soft and cozy inside.